Police are still searching for two teens who shot two men on SEPTA’s Market Frankford train last night. The incident started after the 76ers-Bulls game when the teens got angry over the 35 year old Bulls fan’s celebration. As the teens left the train at 46th street, one turned and fired a shot into the train hitting the victim in the stomach and another man in the leg. The shooting victim is in critical condition. A pit-bull fighting ring has been busted in Chester County. A couple ran dog fights in their home where they were also raising their 5 children. Police arrested Shane Santiago on drug charges and upon entering his home, found the bloody dog fighting operation. Santiago and Laura Acampora are facing animal abuse and child endangerment charges. The family of the man shot by an off duty Philadelphia police officer three years ago has been awarded $4.7 million dollars by a federal jury. The jury also found the City of Philadelphia not responsible, ruling that Officer Frank Tepper was not acting as an officer during a drunken scuffle outside a baby shower. Tepper was convicted of murder and is in prison for life. A fire in a South Philadelphia warehouse destroyed the props of the Fralinger String Band they were planning to use on New Year’s Day at the Mummers Parade. The four alarm blaze sent one woman to the hospital and destroyed one home while affecting others. The fire is believed to have started in an illegal auto repair shop that has had previous citations. A fire broke out this afternoon in South Philadelphia at the storage location for the Fralinger String Band. 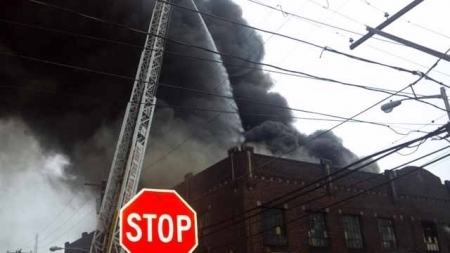 The four alarm blaze started about 2 this afternoon where Fralinger stores its props at 2nd and Wharton Streets. Dozens of firefighters were called in to bring the blaze under control. At least one injury was reported and a wall has collapsed during the fire, which is still under investigation. Philadelphia television sports reporter, Leslie Gudel may be losing sleep over her invention designed to give moms a chance to rest. Gudel, a mother of two, developed an infant seat called the Nap Nanny. Now the U.S. Consumer Product Safety Commission has filed to have the product pulled from the market. Five infant deaths have been associated with the seat, but Gudel points out that in at least 4 of the cases, the seat was be used improperly. The EZ Pass on your windshield will be getting smaller. 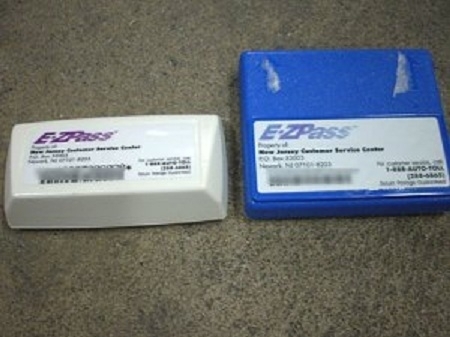 The EZ Pass Group is introducing a new EZ pass transponder that is about half the size of the original. Subscribers will begin to get the new transponder near the end of their 8 to 10 year life. The smaller units cost the toll agencies about half the price of the old ones. Radnor Township Police are searching for a missing 13 year old feared to be with a 20 year old man already wanted for corruption of minors. Savanna Marie MacMullett was last seen around 4 pm Monday in Garrett Hill. MacMullett met 20 year old Ashley Ryan Hareford on Facebook. Anyone with information is urged to call Radnor Police at 610-688-0503. UPDATE: Savanna MacMullett as been found and Ashley Hareford arrested at a bus stop in Washington, DC.